Messara (also known as Cretan) horses are a light riding and draft horse found on the island of Crete off the coast of Greece. The native mountain-type Messara pony exists on the island of Crete since year 1000 or longer. The name comes from the Mesara Plain where they are mostly found. 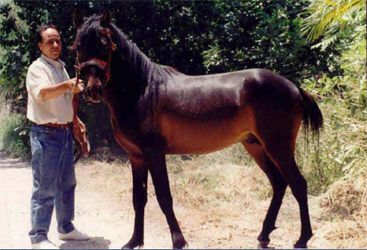 The modern Cretan horse was developed by crossing the native mares on Arabian stallions imported during the Turkish occupation in the 17th century. They are now a rare breed with around 100 representatives. Since 1994 there exists a studbook and conservation program has been started. Their main coat colors are bay, brown (a variation of bay), black, and gray. They usually stand between 12.2 and 14 hands high. Most Messara ponies have a natural pacing gait that is easy and comfortable to ride. They are very good at walking on rocky ground and uneven surfaces. Messara ponies are used for light farm work and for transportation but more and more also for riding and racing. The stallions are often crossed with female donkeys (Jennies) to produce Hinnies.